View some interesting facts and figures about certification. CFRE International makes two changes that may benefit you! Certification is a review process that determines if an individual has attained certain levels of education, knowledge, and experience. Certification recognized individuals determined to have achieved a certain knowledge base and skill level. Certification is usually determined by assessing if a candidate has met pre-determined requirements of education and experience along with an examination. Currently, there are four professional certification designations available to fundraising professionals. CFRE (ret.) - Certified Fund Raising Executive, Retired authorized by the CFRE Professional Certification Board. ACFRE - Advanced Certified Fund Raising Executive awarded by ACFRE Certification Board of the Association of Fundraising Professionals. FAHP - Fellow of the Association for Healthcare Philanthropy, granted by the Association for Healthcare Philanthropy. AFP Collegiate Certificate in Fundraising - Certificate of achievement awarded by AFP International. What Can Professional Certification Do For You? Challenge You to Excel on the Job The Professional Certification program recognizes successful on-the-job philanthropic practice based on actual education, experience, performance, and service. Challenge You to Continue Your Training Career performance and advancement can be achieved using the certification process to document your expanding knowledge of fund-raising practice, resource development and management, and to prepare for successful recertification. Reach out to Your Professional Association and to Your Community Service to your profession and volunteerism of your professional knowledge to benefit others exemplify the true spirit of philanthropy, for which the certification programs will recognize you. Recognition for Personal and Professional Achievement The Certified Fund-Raising Professional credential enjoys widespread recognition. Adding standing in professional certification assures the public that their gifts of time, talent and treasure are in the hands of a professional. CFRE status tells current and prospective employers that you have voluntarily met a recognized standard of excellence. Achieving and maintaining CFRE status will signify accomplishments of which you can be proud. In July 1996, the boards of the National Society of Fund Rasing Executives (AFP) and the Association for Healthcare Philanthropy (AHP) voted to implement a partnership program to create one baseline credentialing program for fund-rasing professionals. The first CFRE Professional Certification Board met in October, 1996. Three additional organizations are part of the partnership program: Association of Lutheran Development Executives (ALDE); National Catholic Development Conference (NCDC); and National Council for Resource Development (NCRD). CFRE Board members from each of the partner organizations represent both professional setting and geographic diversity. The CFRE program is open to all individuals meeting the eligibility requirements, regardless of affiliation with a professional association. To participate significantly in advancing the evolution of the field of philanthropic fundraising from an emerging discipline to a recognized profession. The CFRE Professional Certification Board fulfills this mission by setting industry-wide standards for philanthropic fundraising practice and by offering, refining, promoting, and administering a credible and respected process for accrediting practitioners who have met the Board's standards. The CFRE process will be accredited by the National Commission of Certifying Agencies. A minimum of 80 points in Education, consisting of points awarded for academic education and continuing education (1 point per clock-hour or .1 CEU). CFRE candidates are expected to have participated in on-going educational activities. Eligibility requirements are detailed in the CFRE Candidate's Handbook which also contains an application. The candidate's knowledge of fundraising principles and techniques is measured by a written, multiple choice examination. Areas covered on the examination include: prospect identification; solicitation; donor relations; volunteerism; management; and stewardship. Examination of the candidate's knowledge of fundraising principles and techniques via written examination. Once you pass the examination, you will be officially notified by the CFRE Board, in writing, that certification has been conferred. Certification is valid for three (3) years. Because fund raising is a dynamic and rapidly changing field, continuing education and other professional development activities are desirable for all fundraisers, and are required in order to maintain status as a Certified Fund Raising Executive (CFRE). Recertification is required every three (3) years. Specific requirements include: continued employment in the fundraising field; continued successful performance as a fundraising professional; a minimum of forty (40) contact hours of continuing education over the three year period; and continued service to the fundraising and not-for profit sector. Applicants for recertification also renew their written pledge to uphold a code of ethics and the Donor Bill of Rights. What is the ACFRE Program? Written Application All candidates must complete a written application which requires information in three areas: Employment; Education; and Service to the Profession or Other Not-for-Profit Organizations. Written Examination After demonstrating minimum requirements on the written application, a 125-item multiple-choice examination measures a candidate's knowledge of general development, management, leadership and fund-raising skills. Portfolio Review Candidates present a portfolio of fundraising materials, personally-developed within the past five years: a planning document, a case statement, and two examples of competency in writing, creativity, management, and teaching/training. Oral Peer Review Candidates articulate a mastery of advanced-level knowledge and understanding, both experientially and theoretically based, of fund-raising ethics, management, leadership, planning and problem solving in the broad field of fund raising and in at least two of the candidate's specialty areas. Code of Ethics All candidates for the ACFRE process must agree, in writing, to uphold the AFP Code of Ethics and Standards of Professional Practice in addition to the Donor Bill of Rights. Recertification All individuals receiving the ACFRE designation prior to December 31, 2000 will be exempt from having to recertify. Those who are awarded the designation after December 31, 2000 will be subject to meeting recertification requirements every three years in order to continue to use the ACFRE designation. Completion of the ACFRE process must be within three years from the date the application was approved. Why Should I Become an ACFRE? 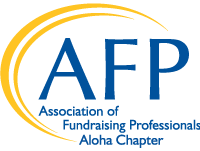 The Advanced Certified Fund Raising Executive (CFRE) credential provides you with a recognizable demonstration of your personal and professional achievement in and commitment to the fundraising profession and to philanthropy. It has taken many years of hard work on the part of colleagues, conducting research, setting standards, developing ethics, and creating an accepted body of knowledge to reach the point where fund raising is at last considered a profession. Certification is an important part of this process. The funds that you raise, the programs you direct and the volunteers you work with attest to your abilities. The ACFRE credential is an outward sign to your employers, your donors and your colleagues that you have met requirements and mastered the specific standards set for your profession. Who Can Become an Advanced Certified Fund- Raising Executive (ACFRE)? Currently working in the profession. Currently holds Certified Fund Raising Executive (CFRE) credential and has recertified at least once; or current Fellow, Association for Healthcare Philanthropy (FAHP). Adherence to AFP's Code of Ethical Principles and Standards of Professional Practices and the Donor Bill of Rights. B.S./BA degree or equivalent experience. Participation within the previous five years in at least 15 contact hours of senior-level management and 15 contact hours of senior-level leadership seminars and/or courses. Academic Courses and/or Writing for the Profession may be considered. Participation within the previous five years in at least one 3 hour ethics course. Membership and active participation in a field-related professional organization, with demonstrated volunteer service to not-for-profit organizations.